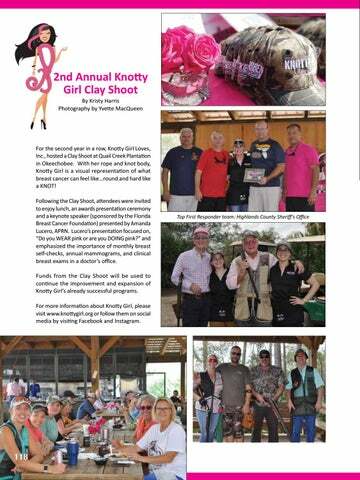 For the second year in a row, Knotty Girl Loves, Inc., hosted a Clay Shoot at Quail Creek Plantation in Okeechobee. With her rope and knot body, Knotty Girl is a visual representation of what breast cancer can feel like…round and hard like a KNOT! Following the Clay Shoot, attendees were invited to enjoy lunch, an awards presentation ceremony and a keynote speaker (sponsored by the Florida Breast Cancer Foundation) presented by Amanda Lucero, APRN. Lucero’s presentation focused on, “Do you WEAR pink or are you DOING pink?” and emphasized the importance of monthly breast self-checks, annual mammograms, and clinical breast exams in a doctor’s office. Funds from the Clay Shoot will be used to continue the improvement and expansion of Knotty Girl’s already successful programs. For more information about Knotty Girl, please visit www.knottygirl.org or follow them on social media by visiting Facebook and Instagram.